This is a recent commission for a birthday present. They’re two cats with completely different personalities so I tried to capture their relationship with each other. In the end the commission was used for a print and a custom hardback notebook cover. Why should I get a pet portrait? There comes a point in a pet owners life when they ask themselves “How can I capture the pure essence of my furry friend and get it in a form I can show off to my friends?” Photography? No, it will never stay still (unless it’s a tortoise or snake). Bronze statue? You’ll end up dropping it on your foot. Sand painting? Your dog will eat it within seconds. 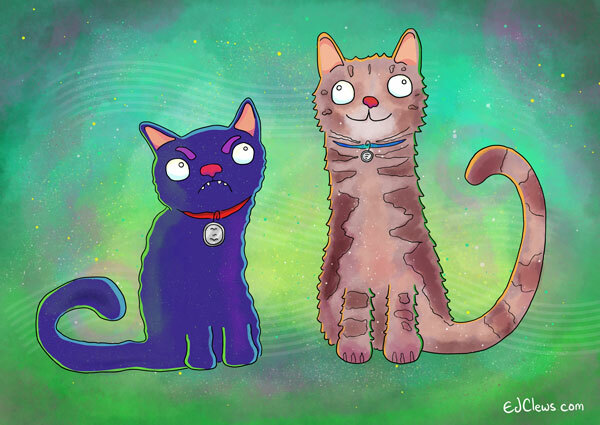 How about a nice bespoke pet portrait done in my illustrated style? Drop me a line at ed@edclews.com and give me your ideas. It doesn’t have to be animal portraits, it can be people, robots, anything you like. If you don’t have the budget for a full commission, I also have lots of cards, stickers and prints for sale which are ideal for birthdays and Christmas.